Many, many years ago, when dinosaurs roamed the earth and our daughters were too small to read a calendar, I made a couple of simple little quilts to help them count down the days to Christmas. 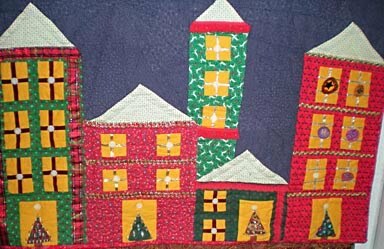 The top one is a Christmas tree and the bottom one is a street scene, and there are 25 velcro-backed "ornaments" which get transferred one by one to the tree. Wrong. The Fashionista arrived from New York, looking amazingly grown-up and sophisticated in her City Black outfit, and demanded, "WHERE ARE THE CHRISTMAS QUILTS?" 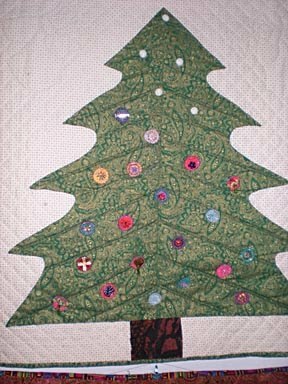 Within minutes the girls had unearthed the quilts and hung them, and then they took turns moving ornaments so fast ("After all, we have a lot of days to catch up on,") that I got only one unblurred snapshot. The idea for the Great Purple Monstrosity, aka Shrine Composition 2, is to go back to the origins of the word. "Shrine" comes from Latin "scrinium," meaning a thingie to hold books. I want the incomplete and overlapping layers of text to reference ancient writings; then I'm going to make a scroll to put in each of the "niche" areas. 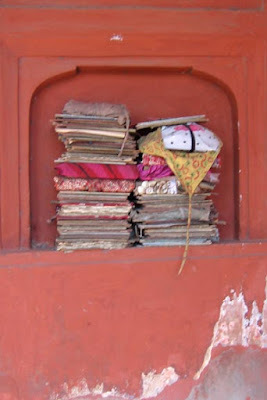 The niche idea is taking off from the niche full of fabric-wrapped books I saw at the Jama Masjid in Delhi a few years ago. I don't know why the "niches" here are half-window blocks. I tried some full-window blocks and didn't like the way they looked. I kind of like it this way, with some openness and some confusion about perspective. Now that I'm looking at the snapshot, I'm beginning to feel that the big windows should be below the smaller windows. Dither, dither, dither. 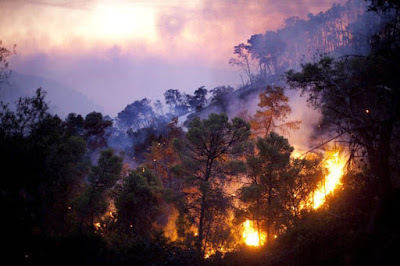 I captured this photo from one of the many stories about the forest fire in Israel. The colors are beautiful. The composition is excellent. If I didn't know the source, it would simply be a glorious image to go in my "inspirations" folder, next to innumerable Hubble space photos. How can we make art out of someone else's tragedy? How can we not try to transform tragedy into art? This is getting over my head. I'm going to go cut up fabric. I'm going to get back to artstuff soon... but today I'm waiting to see whether the DREAM Act makes it through the Senate. It looks like a good act to me. It's far from an amnesty; it's a path to citizenship for young people who were brought here illegally through no fault of their own, who MAY be able to get citizenship if they complete two years of military service or college education and don't screw up for ten years. Aren't these exactly the sort of people we want as citizens? I don't understand all the opposition to the Act. I just don't get it. Maybe there's some major, major loophole I'm missing? So today, maybe, we'll find out; did this dream come through the gate of ivory (false dreams) or the gate of horn (truly prophetic dreams)? OK, up to now I've wanted to give Julian Assange the benefit of the doubt. Maybe posting all those war reports did give us information we needed to have (though there don't seem to have been any surprises in them), and the contention that he put Afghan informants and villages at risk doesn't seem so strong now that after, what, four months, there've been no reports that the Taliban put anybody in the reports on the hit list. Maybe they couldn't stand the sheer boredom of reading the reports. I certainly didn't make it very far into the data. Diplomatic cables are dicier. I don't personally subscribe to the idea that all diplomatic communications should be conducted in the light of day and with full disclosure to all concerned, but I can understand that someone else might believe that. In any case, I think it's a hopeless ideal to pursue, sort of like campaign finance reform; diplomats are going to sneak off into dark corners, and money is going to flow into campaigns, no matter what you do. But now Wikileaks has published a list of sites "that, if lost, might “critically impact” public health or the national security of the United States." I don't see how this contributes in any way to the "open dialogue" that Assange claims to support. I don't see how it can be interpreted in any way other than as an attack on the United States. Given the nature of the Internet, it may not be possible to prevent this kind of information from getting out. But can we at least stop pretending that the person who published it had noble motives? Anybody who defends Assange now should understand that they are defending an active enemy of this country. Some of you may not remember the death threats against Salman Rushdie after he published a novel that some people deemed offensive to Islam. You may not have been too concerned about the murder of Theo van Gogh for making a film critical of Islam's treatment of women. You may feel that Geert Wilders deserves to be put on trial in Amsterdam for "inciting racial hatred against Muslims," because he criticized the Qur'an... and anyway, all that's over in Europe. We have free speech in America. In mid-September of this year, a cartoonist named Molly Norris changed her name and went into hiding. The reason? Death threats against her from that lovable cleric Anwar Al-Awlaki, fan of those good ol' boys Al Qaeda, currently believed to be hiding out in Yemen - threats that the FBI advised Norris to take very seriously (though they offered her no help whatsoever). The inspiration for the death threats? In an attempt to satirize exactly this kind of censorship-by-intimidation, she suggested an "Everybody draw Muhammed Day." An American citizen is forced underground in America by threats from a religious extremist. In August of this year, President Obama found time to weigh in on the constitutional right to build a mosque in New York. In September, he found time to comment on an obscure whackjob in Florida who threatened to burn a Qur'an. So what did he say in defense of an American citizen exercising her right of free speech? The New York Times? Buried the story in "Local News." No columnist felt it worth mentioning. The ACLU? In the month following Norris' disappearance, they found time to speak up for the freedom of teenagers to send naked pictures of each other by cell phone, for the right of Westboro Baptist Church to picket military funerals with signs saying "God Hates Gays," against the idea of banning websites that openly sponsor jihad against America. Freedom of speech is being eroded in Europe. Here, we have a Constitutional amendment that explicitly guarantees free speech. But the First Amendment is just words on parchment if we do not exercise our rights and speak out in support of everybody who voices unpopular opinions. Not just the unpopular opinions we agree with, or the ones that don't inconvenience us. All of them. Freedom of speech: use it or lose it. Which are we going to do? 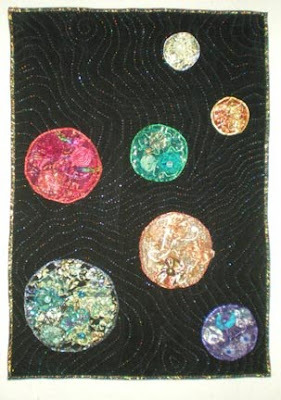 I managed to get a slightly better snapshot of one of the embellished circles in Dreamworlds, and now that you can see it I thought I'd add some details about the making of this quilt. This thing got started because, while rearranging fabric shelves, I noticed that over the years I'd acquired a number of pieces of lace with metallic accents, and I thought they'd look good over black. The background is a black suede-ish FUO (fabric of unknown origin) which I picked because I thought the slightly textured stuff would make a better contrast than just plain black cotton. 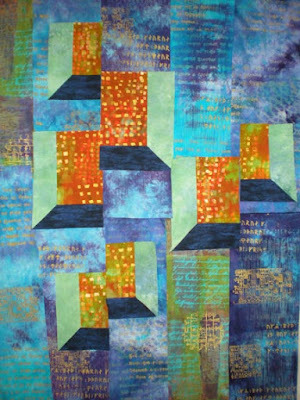 I made the quilt as a collection of square and rectangular blocks, each containing one, or two, or none of the embellished spheres, so that I could work on the embellishments without having to manipulate the whole quilt top. The first stage was to cut circles of metallic lace and fuse them to the black pieces. Cutting out the lace itself was easy enough - I ironed freezer paper circles on and cut around them - but fusing with black Mistyfuse was a total PITA. Mistyfuse is so light and wispy that it likes to drift and ripple and generally not behave like a flat surface. Cutting out circles of it to go under the lace circles was hard. Lining them up with the lace circles for fusing was even harder. No matter how carefully I placed the pieces before laying down the parchment paper and fusing, some of the Mistyfuse would manage to peek out from under the lace and make a nasty shiny blotch on the black suedecloth. I spent a lot of time scratching the stuff off with my thumbnail. I feel really stupid about this because there ought to be an elegant solution to the problem - there should be some sequence of freezer paper, cutting, fusing where everything is held stable all the way through - but I couldn't think of one. It's like getting the cannibals and the missionaries across the river - until you think outside the box, at least one missionary always gets eaten - and I didn't get out of the box here. If anybody can think of a better way to do it, please tell me! After that, it was just a matter of searching through and playing with glitzy fabrics, cords, ribbons, buttons and whatever else came to light in my stash. The only hard part was that I had to reorganize four more stash drawers just to find the stuff! Each circle went more or less the same way. First I tacked it down around the edges, then I bordered the edge with some narrow metallic braid. (I did try combining those steps. It was a mistake.) Then I "cut" out smaller circles of synthetic sheers, using a Versa-tool to burn the circles out and seal the edges in one step, and didn't burn myself hardly at all. Well, not more than 2 or 3 times. Next came any other relatively flat embellishments, like ribbons, yarns, or satin cords. 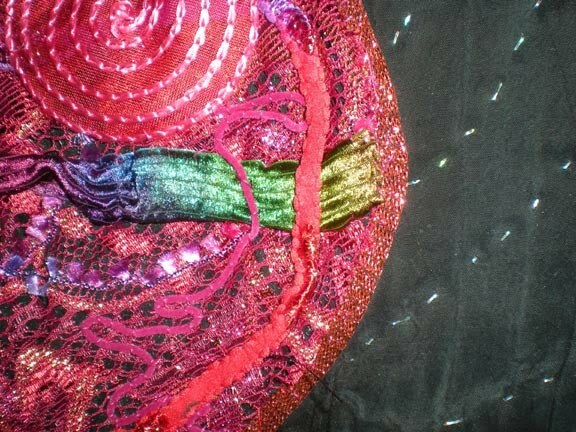 Finally I added gathered circles of wired ribbon, puffy yo-yos of sheer fabric, and buttons. I hand quilted it with Sulky holographic sliver thread. This was my first time using the Vivian Mahlab school of quilting (don't sit at a machine, do it by hand, don't worry about tiny little stitches, make the color of the quilting thread part of the design) and I loved it. 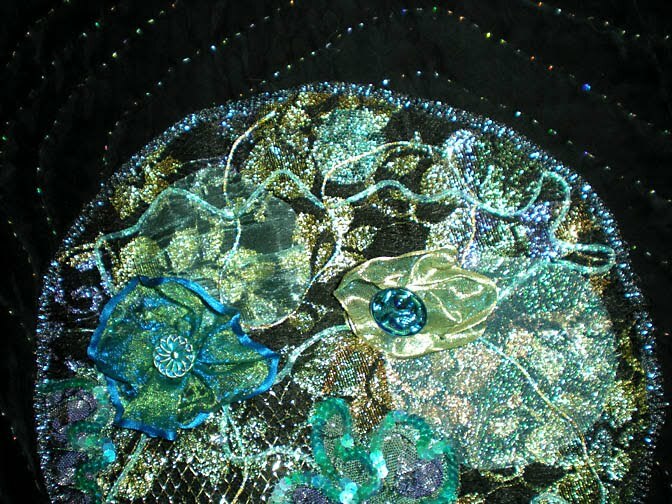 I really, really, really do not like sitting at a sewing machine and wrestling a quilt under the needle for hours; it was much more rewarding to hold this piece on my lap and see the bright sparkling lines move over the black. Anyway, I don't think the sliver "thread" would have held up in a machine. Several weeks ago, a number of newspapers (including my hometown Austin-American Statesman) decided not to publish a "Non Sequitur" panel by Wiley Miller, apparently thinking that even using the name of Muhammed in a caption was... well... gee, it might offend some people. Take a look here and decide for yourself how offensive it was. Today, to my great delight, he got one printed that satirizes the pusillanimous editors. It's online here. Actually, though - if you're finished chuckling over the cartoons - this episode is serious too. This kind of self-censorship is a step towards giving away our freedom of speech. Don't know about you, but I'm rather fond of free speech. In fact, I am generally in favor of the whole Bill of Rights. Robbie of Robbie's Paw Prints just pointed out that comments are bouncing back. Oops. I closed my old email account this summer and am now using mb(at)flameweaver.com. After some bemused poking around the Blogger site I found the old email still hidden under the Comments tab and changed it. Everything should work now - inshallah. Okay, this is embarrassing. I spent a good part (well, actually a really bad part) of the last year slogging through the worst depression of my life. Along with most other things more complicated than breathing, this blog was abandoned. I couldn't bead. I couldn't sew. I definitely couldn't do something so audacious as posting my work out in public, acting as if anybody would be interested in it. Well, that phase seems to be over. I started Making Stuff again a couple of months ago; today I photographed a small wall quilt and I'm going to put up a couple of the pictures. Right now. Before I start to hyperventilate. Before I talk myself out of it. After all, it's not like anybody would still be looking at this blog when it hasn't been updated for a year, right? So I'm basically talking to myself here.